Space-efficient and comfortable cable control module for a strong torso! Do lat pulls as well as rowing exercises and train your arm muscles on the Finnlo lat pull module Multi-Lat Tower. Incl. lat pull bar (upper cable control) and triceps bar (lower cable control). Illustrated weights are separately available. 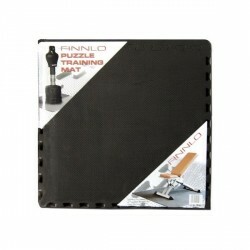 Many exercises can be done for torso muscles with the Finnlo Multi-Lat Tower. Besides lat pulls, it offers many curl and rowing exercises. Choose the weight resistance individually: you can use weight plates to adjust the resistance. A weight block is not required and it makes the Finnlo lat pull module Multi-Lat Tower lighter than other multi-gyms, which can even be moved. The cable control unit requires only small space: with less than 2 sqm of set-up area, the Finnlo lat pull module Multi-Lat Tower fits also in smaller training rooms. 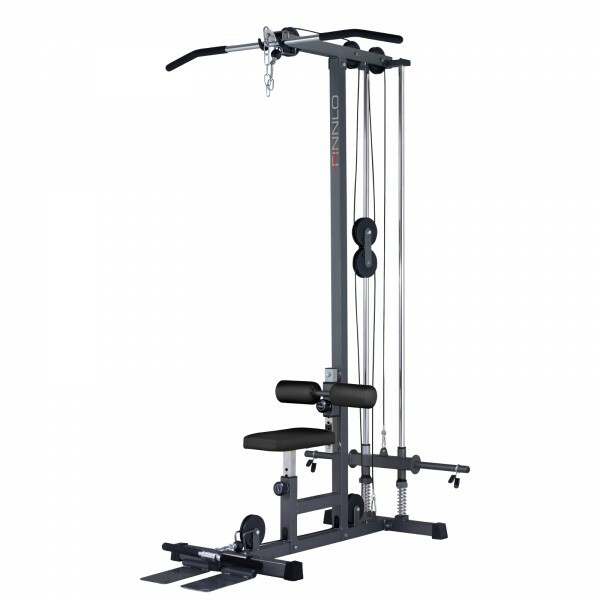 210 cm offer enough height, so tall persons can also exercise with the multi-gym. Exercising with the Finnlo lat pull module Multi-Lat Tower is quite comfortable. The seat is well padded and adjustable in height. Crossbars serve the stabilization of the body. The guide rollers are equipped with high-quality ball bearings. This makes the training motion very smooth and comfortable. Muy buen producto a un precio razonable.Funciona de maravilla. Muy contento! Gracias! very happy with this machine. it is a great addition to my home gym. it fits my 30mm plates which is great. it has a very smooth action and doesn't take up too much space. 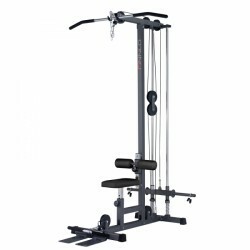 if you are in need a good quality cable machine I would highly recommend this one! Finnlo lat pull module Multi-Lat Tower add to comparison list.